To DIY or not to DIY—is it better to invest time, or invest money instead? If you’re anything like me, this question haunts you when you think about crafty projects and home decor. When are you going to find time to learn how to make that white macrame wall hanging for the bedroom, or should you just hop on Etsy? (Literally my current dilemma). If there was ever a skill that you should spend time learning to get the best bang for your buck, I submit: You should absolutely learn some kind of hand-lettering. Calligraphy’s uses are wide-ranging and money-saving. You don’t have time not to learn hand-lettering! I say this at least half tongue-in-cheek, but still, here's some reasons why, illustrated with real-life examples from some of my favorite people on Instagram. Why keep an inventory of every kind of greeting card message that there is? I can’t tell you how many minutes I’ve spent rummaging through my box of cards trying to find a wedding card, only to find 50 that say ‘thank you’ and two that say ‘congrats.’ Make your own! Even if your card still says ‘Congratulations’ just like every other graduation card, if you lettered it by hand, it is still an incredibly thoughtful gesture, and it will be appreciated as such! In this hipster age, so many card recipients love the idea that they received a one-of-a-kind card, rather than just a print that you bought in a pack of 30 from Target. This also means that little imperfections are cherished. Your card isn’t store-bought; it doesn’t have to look like it came off a printing press—really, it shouldn’t, because it didn’t! It came right from your hand! Making your own greeting cards doesn’t require you to be a DIY superhero or anything, unless making your own envelope out of patterned paper and folding fresh card stock is your thing. I always keep some blank cards with envelopes around, and pull one out when the occasion arises. A simply lettered chalkboard is the perfect addition to a party or event. It's a great way to communicate some directions to your guests, like "sign the guest book," while also contributing to the decor. I've walked into a handful of bridal or baby showers now, only to be immediately recruited to quickly scribe something onto a chalkboard sign. I love doing it! It’s a great skill to have, whether you’re hosting or are a guest! Hand-lettering and gift-giving are besties. You can add a sweet little touch to any gift by creating a hand-lettered gift tag out of card stock. Take it to the next level with a tag-maker punch, which will create a hole for your string and shape the edge of your tag for you. Or, buy blank card stock gift tags, (I really like these round tags, too) or write directly on the package itself! You can also make your own wrapping paper—bust out the kraft paper and watercolor. Black and white gouache are my favorites for this use. Create a baking mix as a gift (brownie, cake, bread) or cocktail mix and write out the recipe in calligraphy. Create a print of your friend's favorite recipe(s) to hang on the kitchen wall, so they'll never have to pull out the cookbook again! Create your friend his/her own handmade stationary set with a tutorial from The Postman's Knock. Write a custom message on a mug with oil-based Sharpies and bake for 30 min so that the paint won't wash away in the dishwasher (let the mugs cool fully in the oven). Calligraphy spices everything up! Turn your journal—of any type—into a work of art! Add creative headers to your journal entries; hand-letter quotes into your journal that you want to remember. Calligraphy also pairs well with Bullet Journaling or dot journaling. 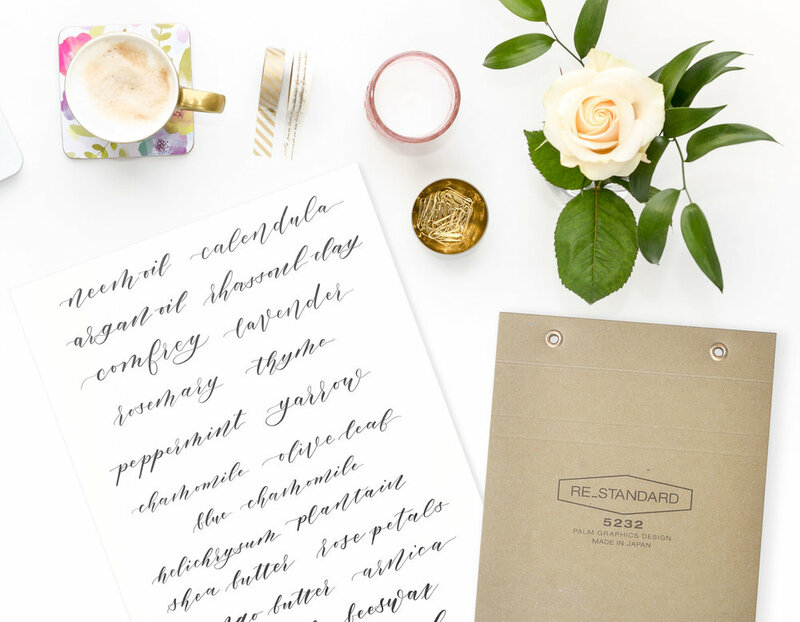 Writing out the headings to your daily entries in calligraphy can be a great way to practice daily, since it can be built into your routine as part of your planner. Bible lettering has also become very popular; it can be a great way to memorize Scripture. Creating hand-lettered sermon notes and class notes can help some people focus. Lettering makes seminars or workshops an opportunity to be creative and remember what you learned, as well. This is the most obvious use for hand-lettering, so I’ve saved it for last. However, it doesn’t include just making your own prints, but you can easily make your own wood signs too (and if you know how to hand letter, you can eliminate the transfer paper for tracing someone else’s design). Or, calligraph your favorite recipes and hang them in the kitchen for quick and stylish reference. Create a nifty sign reminding kids to wash their hands—you can even create a print out a cute poem that, when said aloud, functions as a timer to make sure they wash long and thoroughly. Forget bland sticky notes, you can add hand-lettering to any notes you want to leave for yourself or your spouse. You can calligraph Bible verses to memorize on pretty kraft index cards and put them on your mirror and in your car! If you have a list of tasks you are trying to make into daily habits, create a hand-lettered print and hang it in a spot you’ll see every day. Create motivational quotes and put in your home gym and your office! Have I convinced you yet? Maybe you need to hear that the learning curve is less than you might think. Just print out my free printable eBook Simple Script and jump in—even if you never learned cursive! I've created a brand-new, innovative method for learning hand-lettering that does not depend on having beautiful cursive already.